Outdoor kitchens give you the ability to cook your entire meal outside. It will also reduce the amount of traffic in and out of your home. Outside amenities, like outdoor kitchens and living areas, add to the value of your home. A beautiful outdoor kitchen will make your house the envy of your friends, family, and the entire neighborhood. We at Four Seasons Landscape Management can provide you with exceptional kitchen designs to complement your outdoor space. They have to be based on how much space there is, the climate and the geographic location of a property, how they will be used, and what features they should include. 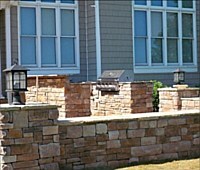 Our creative staff can create an outdoor kitchen concept that would be suitable for your needs and preferences. If you have an idea of how you want it to look and function, let us know, and we will gladly translate it into a practical design. We believe that outdoor kitchens should not only work properly, they should also emanate the theme you are going for while bringing the outdoor appeal to a whole new level. Adding an outdoor kitchen requires as much thinking and planning as an indoor kitchen. In creating outdoor kitchens, it is important to collaborate with what you, as a client, are looking for. Since you will be the one to live with it and use it, it is just logical that the concept would come from you. Our portfolio merely consists of up-to-date suggestions and options that can help give you an idea of how it would look when it's done and what amenities would complement your own outdoor kitchen. Along with the design of an outdoor kitchen, it is also important to specify the details within. There are various types of kitchen features and amenities which you could incorporate to make the outdoors a more convenient and pleasurable venue for cooking and entertaining guests, such as grills, bars, chillers, countertops, seating elements, fire features, sinks, ovens, cabinets and drawers, garbage bins, and a lot more. Even the materials used for finishing features need deep thought. It is important to use only the best construction materials made especially for outdoor kitchens. 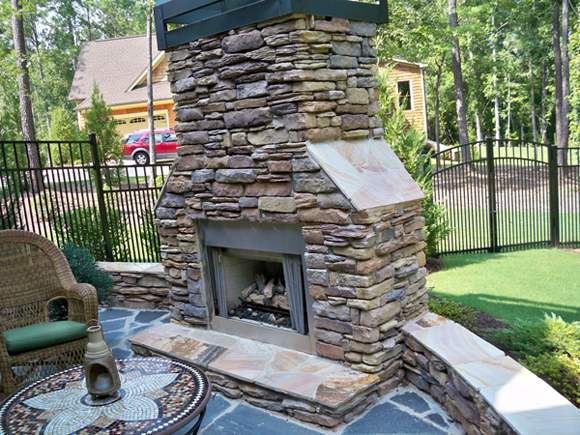 It is our goal to provide only the best outdoor kitchens in Georgia, and, in doing this, we have partnered with reliable names in outdoor living products in the country, such as Harmony and Belgard. You can choose from a wide variety of pre-built fire pits and fireplaces, bars, grills, traditional brick ovens, as well as other pre-built kitchen features. Eating outdoors is always a fun and enjoyable experience with family and friends. With your very own outdoor kitchen, you would be able to cook and dine while enjoying everything that nature has to offer. 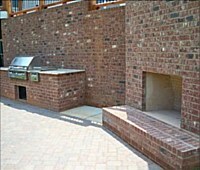 All you have to do is contact us today so we could get started on making your dream outdoor kitchen.